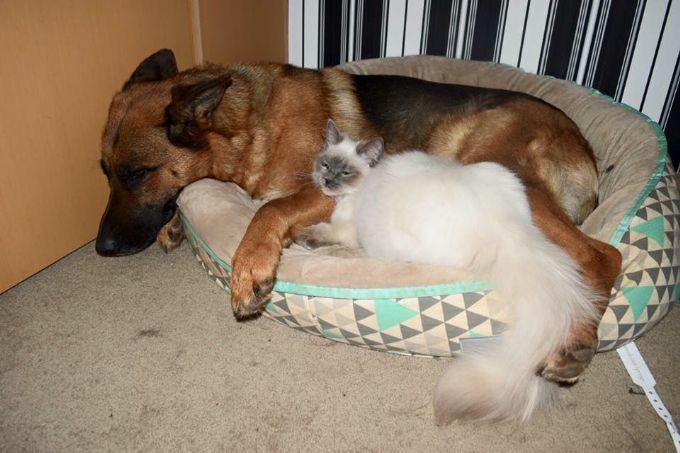 Despite the stereotype, many dogs and cats learn to live together peacefully. 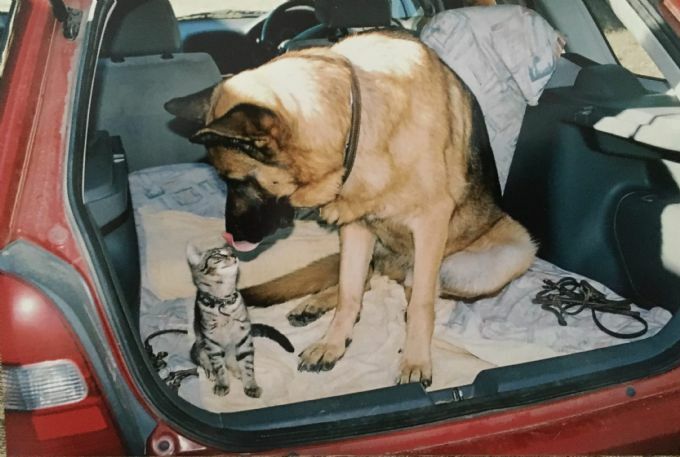 Be patient and take the introduction process slowly, but knowing whether or not your pets get along will also depend on their individual personalities. Follow these steps to maximize the chances of success. 1. 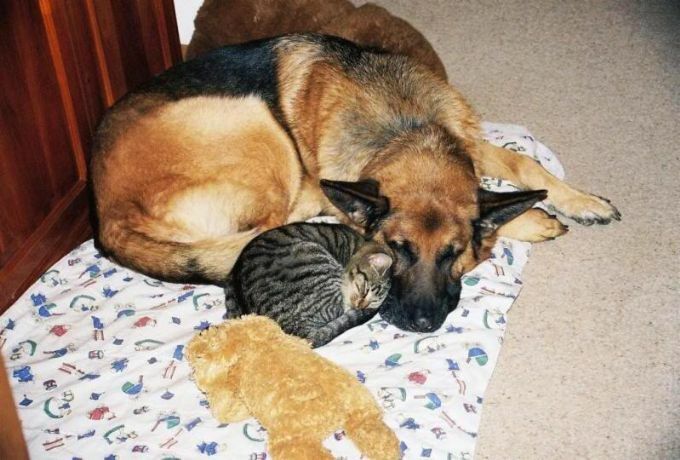 Make sure the cat has access to a dog-free sanctuary at all times. 2. Sanctuary rooms can be any size but must have a secure door and ceiling. 3. The space should include a litter box, scratching post, water, food bowl, and toys. 4. Make sure to cat-proof the space by removing any poisonous plants, medicines, fragile knick knacks, and hiding or tying up cords. 5. You might also set up some hiding places or tunnels to help the cat feel safer. 6. Be prepared to manage your pets’ interactions for the next several weeks, if not longer. 7. Ideally, your living spaces will have multiple high areas, like shelving or furniture that your cats are allowed on so they can easily escape the dog if needed. 8. Keep the pets separate for at least the first 3-4 days. Prevent any contact until your new pet has had his vet check-up and been cleared of illness. Confine your new pet in a sanctuary room with the door closed or a separate floor of your house. 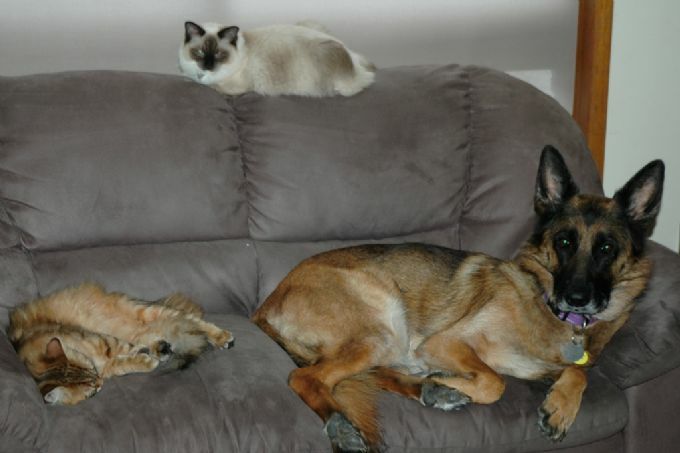 The goal is to allow the pets to get used to each other’s presence without face-to-face contact. Even if they can’t see each other, they can hear and smell each other. 9. The idea is to teach them to associate the presence of the other pet with pleasant things, such as food. With each feeding, move their food bowls a little closer to the closed door. Continue this process until each pet can eat calmly right next to the door. 10. If your new pet is a dog, start teaching him basic obedience cues, such as “sit” and “down.” Keep training sessions short, pleasant, and rewarding for the dog. 11. Once your pets can eat their food calmly right next to the door, conduct meet and greets in a common area of the house. Don't use either animal's sanctuary area. Keep the first few sessions short and calm. Keep the dog on a leash and let the cat come and go as he wishes. Do not restrain either pet in your arms, as injury could result if either pet behaves aggressively. Ask the dog to sit and reward him with small tasty treats for calm behaviour. Give your cat treats as well. If either pet demonstrates aggression, calmly distract and redirect them. Toss a toy for the cat to lure him from the room, or call the dog’s name and reward his attention. Return the pets to their confinement areas. 12. Repeat these face-to-face sessions daily. Save your pets’ favourite treats for when they are together. 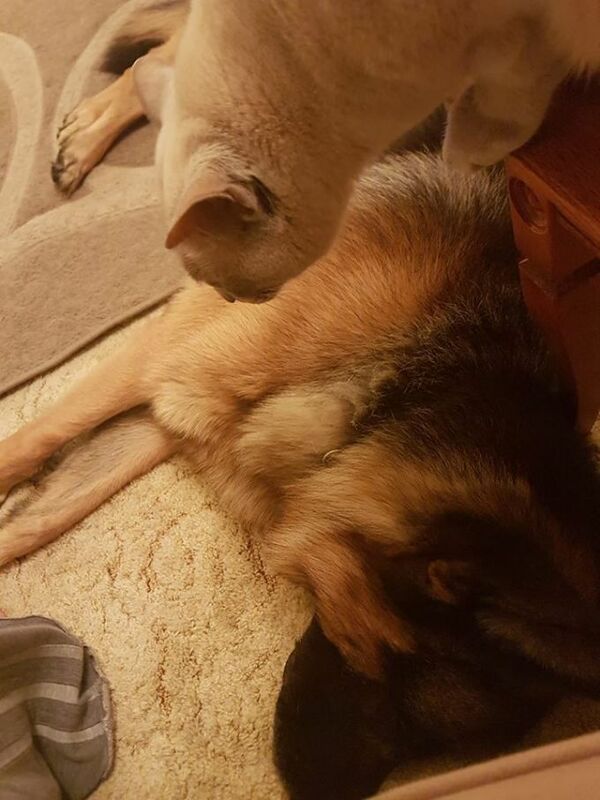 If the cat attempts to leave the room, allow him to do so, and do not let the dog chase him. Try to end each session before either pet shows stress or aggression. 13. When the animals appear to be getting along well, allow them loose in the room together, keeping the dog’s leash attached and dragging on the floor so that you can step on it and prevent him from chasing the cat if he gets excited. If tension erupts, go back to the earlier introduction steps and repeat the process. 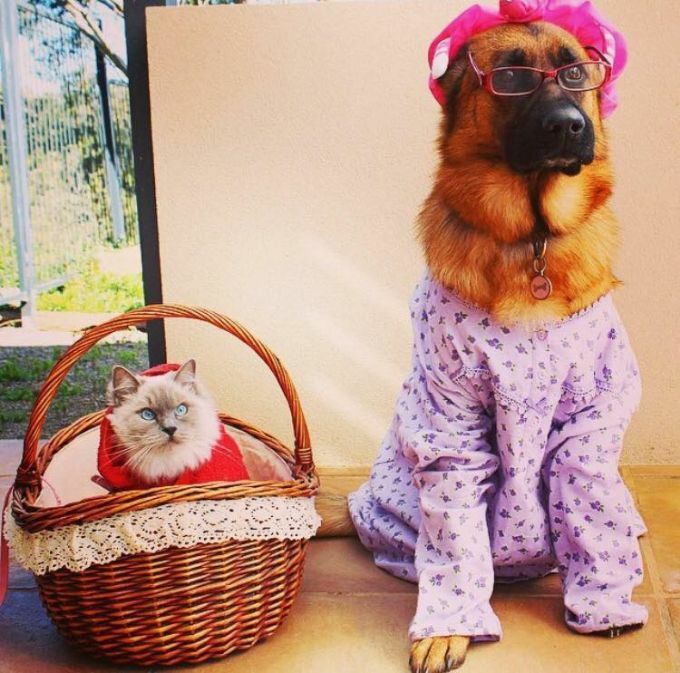 Make sure the cat has access to a dog-proof sanctuary room at all times. 14. Continue to separate the pets when you are not there to supervise. 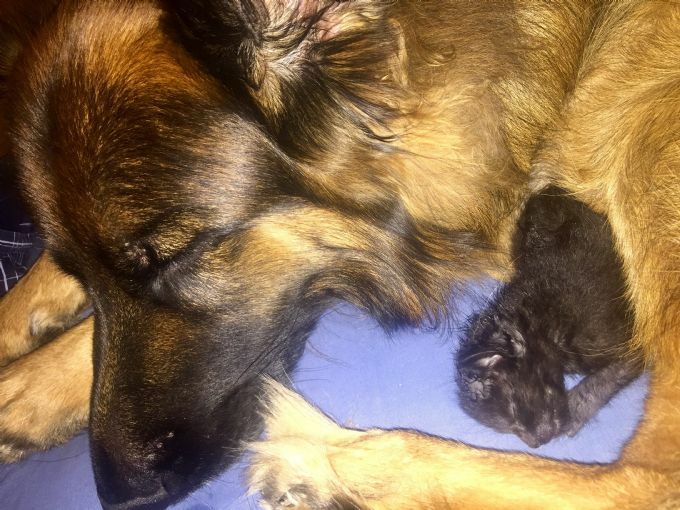 Welcome to its Raining Cats & German Shepherd Dogs Photo Album.